Let’s pretend we’re going on a stakeout. 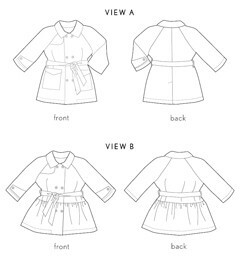 This classic unlined trench coat pattern for boys and girls includes double-breasted button front, raglan sleeves, shoulder flap, button tabs at sleeves, and tie belt at waist. The unisex version of the Secret Agent Trench Coat (View A) has pockets, while the ultra-feminine alternate version (View B) features a dropped-waist skirt. Boy’s or girl’s coat. Classic unlined trench coat includes double-breasted button front, raglan sleeves, shoulder flap, button tabs at the sleeves, and a tie belt at the waist. The unisex version (View A) has pockets, while the ultra feminine alternate version (View B) features a dropped-waist skirt. Each of our patterns calls on a unique set of sewing skills. Haven’t ever done one of these things before? Don’t worry. We’ll walk you through it, step by step. After successfully sewing this pattern, you will have developed the following skills: bias bound seams, buttonholes, collar, patch pockets, and raglan sleeves. Medium-weight woven fabrics like canvas, corduroy, twill, denim, and coated (raincoat) cottons. Coordinating thread, light- to medium-weight fusible interfacing (match your fabric with the appropriate weight of interfacing), eight 3/4" buttons. For finishing the seam allowances: 1/2 yard of lightweight fabric like quilting cotton, broadcloth, or shirting for bias binding or 2 packages of 7/8" single-fold bias tape/binding (both are optional). Don't worry, I can't stand people who sell email lists either. You can be assured that I will respect your privacy.